Lately, DH has been calling my attention to things that I have started but were not able to finish. One such example was when I was sweeping the floor of some paper clutter. I was holding a broom and sweeping when suddenly something caught my attention. I stopped what I was doing and went to attend to the other thing. I eventually forgot that I was holding a broom and left it on the floor, much to DH’s dismay of course. Ooops! This made me reflect some and it made me realize that indeed, I do have many things that I have started but don’t get to finish. A quick look at my library shows a lot of books with the bookmarks still in the middle. My to-do-lists from months ago still have tasks unchecked. My project pile continues to grow with no final product to show. Uh-oh. Time to change my ways. And so on the last day of my 21-day healthy habit challenge, I shall try to form the good habit of finishing what I have started. 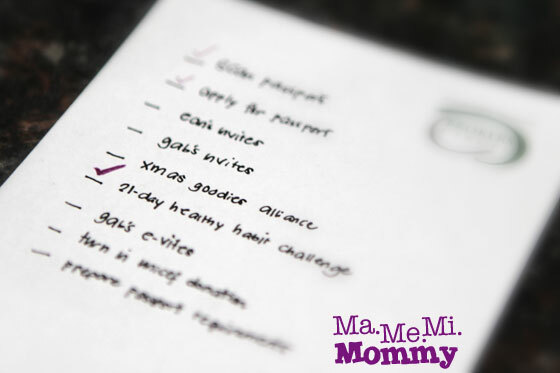 To kick-start this habit, I am now placing a check on one of the tasks in my To-Do list. Yey! 🙂 3 down, many more to go! Finally done with my #healthisHappening Challenge!